On April 3, 2018, General Dynamics Information Technology closed a deal to acquire CSRA, merging the operations of two massive government contractor IT shops and, according to company officials, bringing in a new era of collaboration across the company. “What we’re trying to do is build a culture of collaboration,” said Yogesh Khanna, senior vice president and chief technology officer at GDIT, at a media roundtable on the one-year anniversary. The combined team of General Dynamics and CSRA leadership will have significant influence over the federal IT market. GDIT has three market-facing divisions — intelligence and homeland security, defense, and federal and civilian — but there’s far more integration between those divisions than outside observers would have originally found in the old GDIT. After the merger, GDIT leadership established a centralized process for handling areas like HR and contracting across the company. “Before GDIT, it was totally decentralized. Within each division you had those functional areas, stovepipes basically,” said Bernie Guerry, chief operating officer and senior vice president of intelligence and national security. They also developed a new centralized growth team that focuses on enterprise deals — those over $500 million — that’s made of solution architects, engineers and pricing analysts. That team then supports each of the three divisions. That centralization has offered the opportunity to go after a staggering monetary value in contracts. “We have planned in 2019 to bid on upwards of $50 billion in opportunities,” said Guerry, adding that GDIT already has about $15 billion underway in the source-selection stage right now. As for the customer agencies and military services GDIT works with, time will tell if the new format of GDIT will offer visible benefits. Aside from helping the company and its customers, that breadth is also designed to benefit the workforce, according to the GDIT officials. Guerry added that the workforce is also involved in setting GDIT’s business imperatives, to reinforce the collaborative culture. 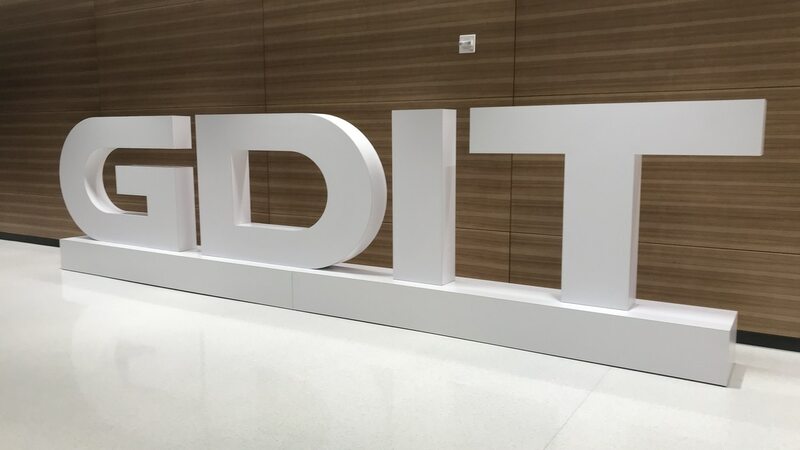 The one-year anniversary also comes with a new logo and design for the GDIT brand, to differentiate the company from what its employees are calling the “sea of sameness” among IT contractors.